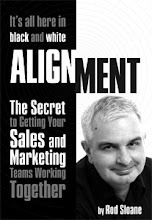 Sales and Marketing Alignment Blog from Rod Sloane: When are you are at your best? I am good at some things and pretty hopeless in others. I am reasonably good at speaking at conferences and meetings. But don't put me in charge of admin or small talk networking. Like you probably, I'm better off focusing on what I do better or naturally. Now, of course, this is nothing new in the 1970's Chris Bull and Janet Mills while working at ICI came up with the concept of your core mission they called it a “core process”. Your core process answers the question what you are here on the planet to do best. Stay with me here, I haven't been eating mushrooms! I encourage you to look at the Core Process system and have a chat with either Nick Heap or Tom Evans, they are both smart, intuitive and supportive individuals. Wouldn't it be better to just to focus on what you are uniquely good at?